​Summer also means making sure that you're carving out time to appreciate the precious moments that only ​the ​hot summer days​ can provide. 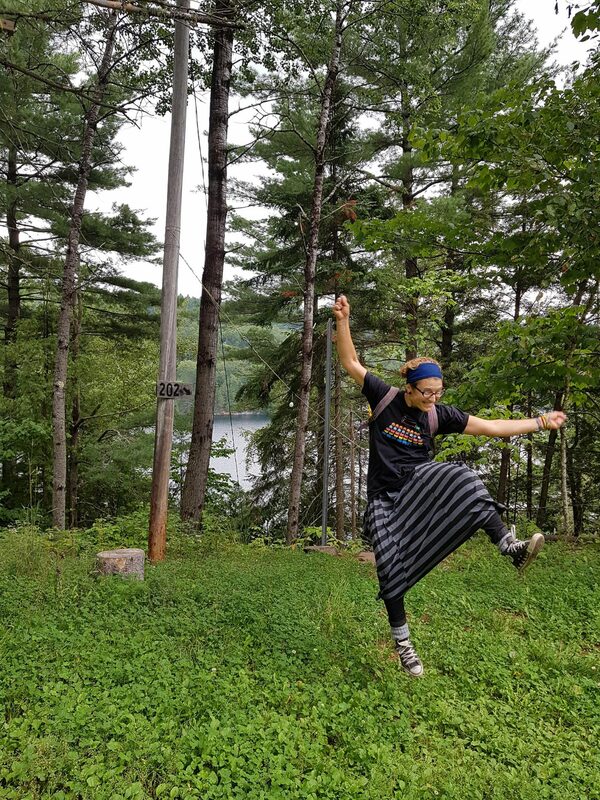 For this Maven, "back to school" came quick this year, partly with a sense of relief to return to a regular schedule, but also with an overwhelming feeling of needing to "hit the reset" button and get my head back into the game. When Kina told me she was spending her last week of summer break alone at her family's cottage focusing on art, I responded with "TAKE ME WITH YOU". Well, wouldn't you know, she said ​"YES"​....on the condition that I don't expect to be entertained. So with that, I booked two days off from family obligations and tagged along to ​the tail end of Kina's escape. It was​ 32​ hours of unplugging and bonding with my ​Maven while we dumped all of our energy into just creating for the sake of creating. 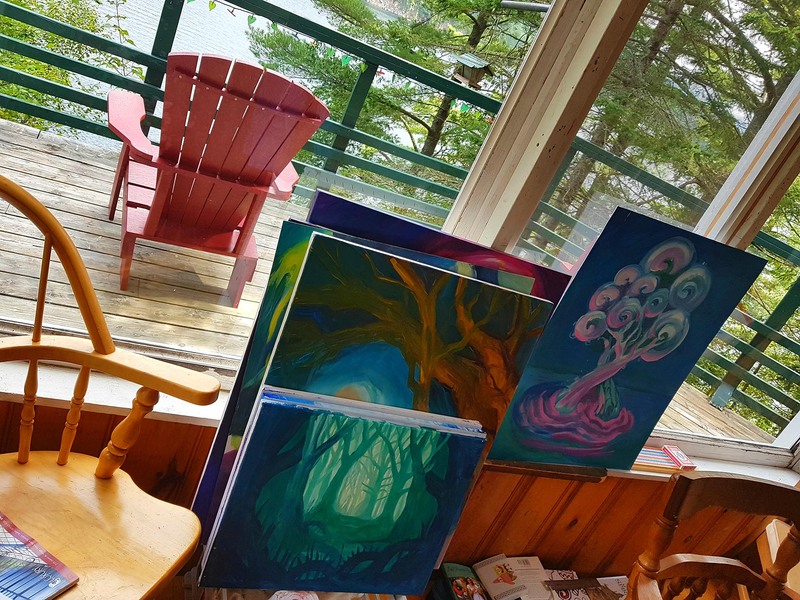 ​Upon arriving at the cottage, Kina had already been hard at work. 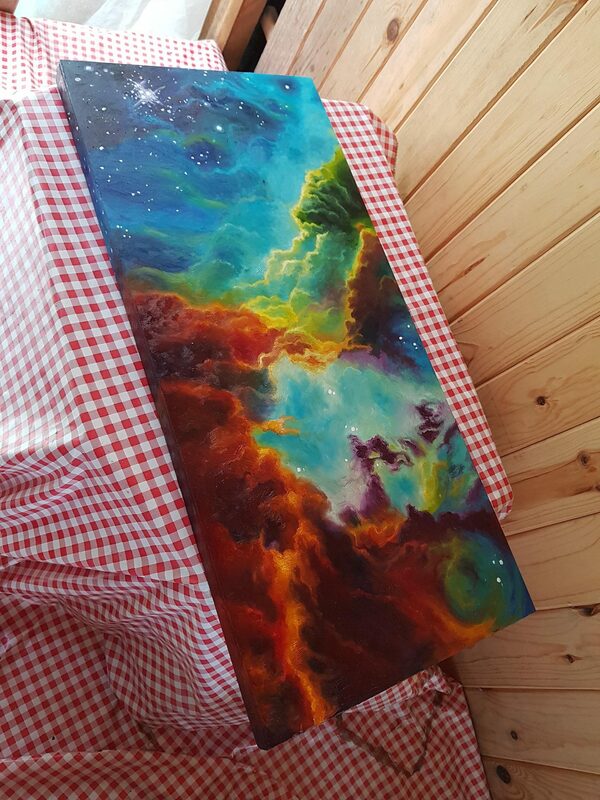 The first thing I saw was this GORGEOUS piece drying in the porch. ​​Visitors to the cottage often leave behind a gift. 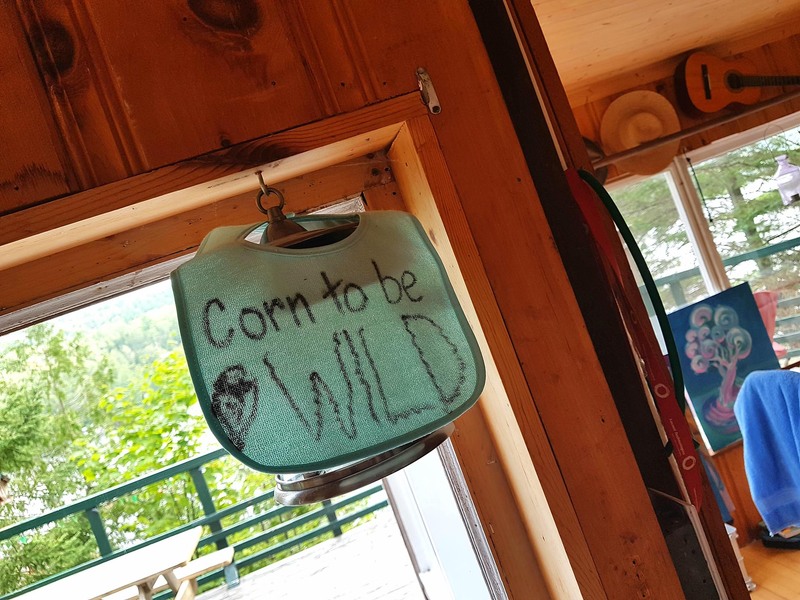 It's a tradition​ that gives the cottage life and vibrancy. 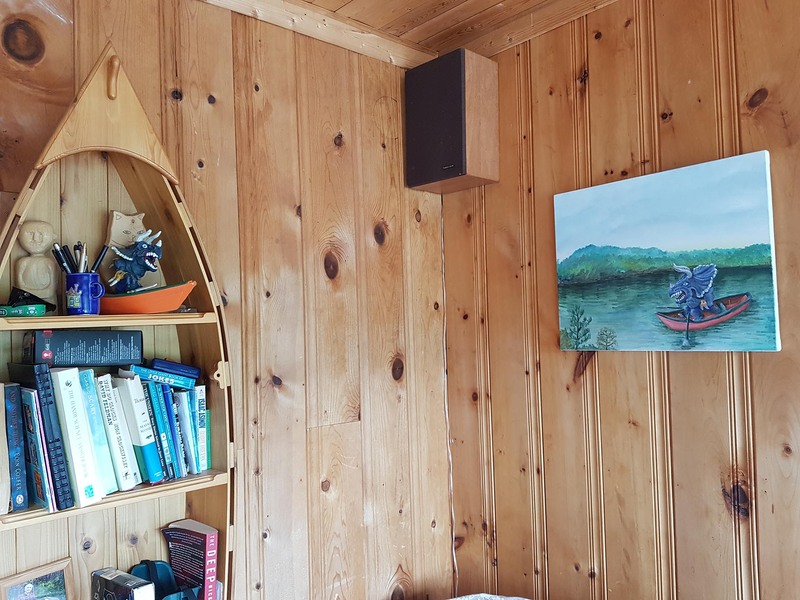 ​Check out just some of the​se "​objet d'intérêts" that adorn the family cottage. See the dino on the shelf? 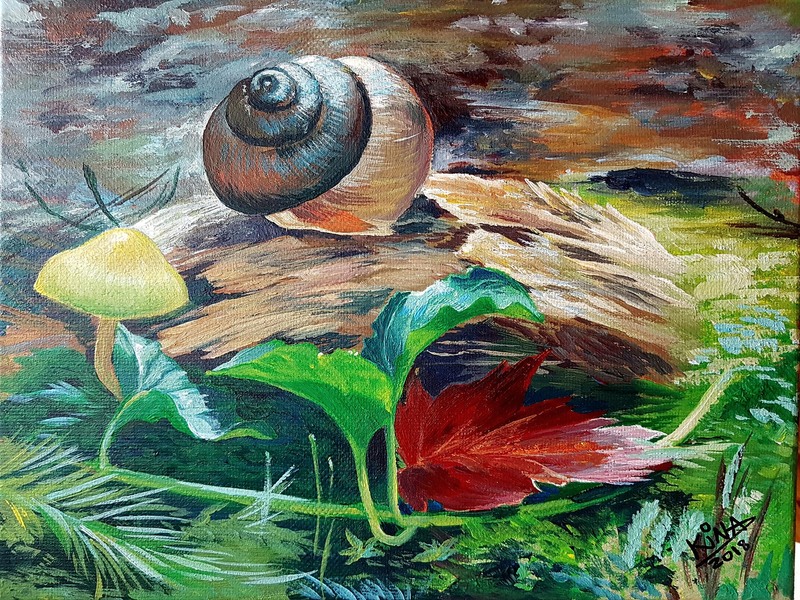 As a young child, Kina's brother had forgotten it at the cottage​ and it has lived there ever since.​ See the painting? That was a gift left by a more recent cottage visitor. ​I think this might win the "best surprise left by a stranger" award. ​Here is even more evidence of Kina's​ creative output before I arrived. ​What better place to ​unleash creativity ​than ​in​ this brightly lit dining room ​with a stunning view of the lake? See those red chairs on the deck? Those are a gift from family friends. ​Here is ​ one of the cottage gifts Kina left this time around. 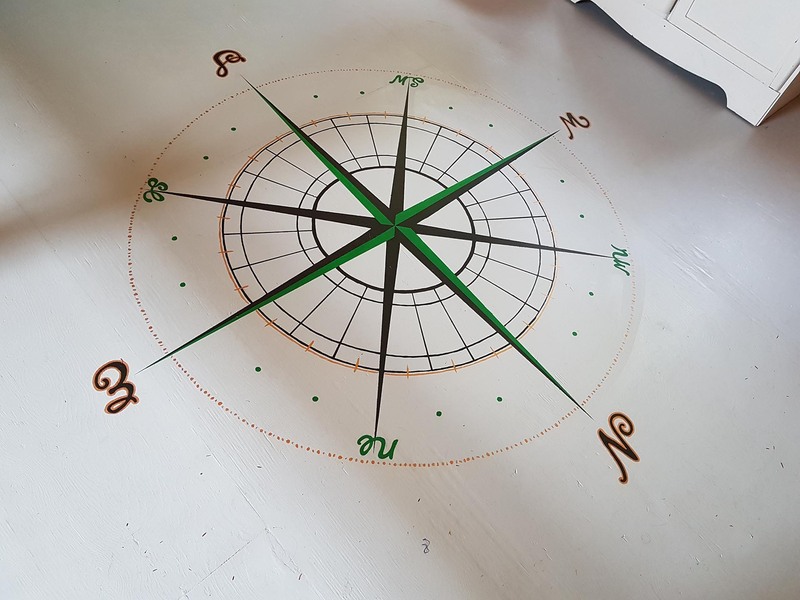 A "true north" compass on the floor of the loft. ​Here is one of the other gifts Kina left behind. It's the painting she worked on while I was there. 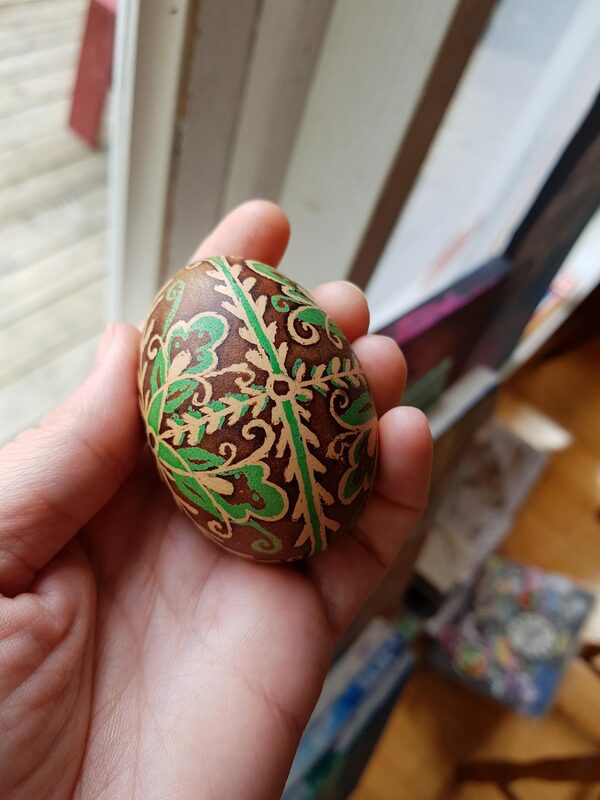 ​Here is what I worked on....more pysanky (I'm obsessed ​since our workshop at Maker House). Though I couldn't leave this behind as a gift​ because I'm letting ​my pysanky dry in the traditional way​, and that means major shifts in temperature can have the​​m explode.​​ ​Being the visitor who left behind the gift of​ semi-​rott​​​ed smell​y egg innards ​is not exactly how would like to be remembered by Kina's family. 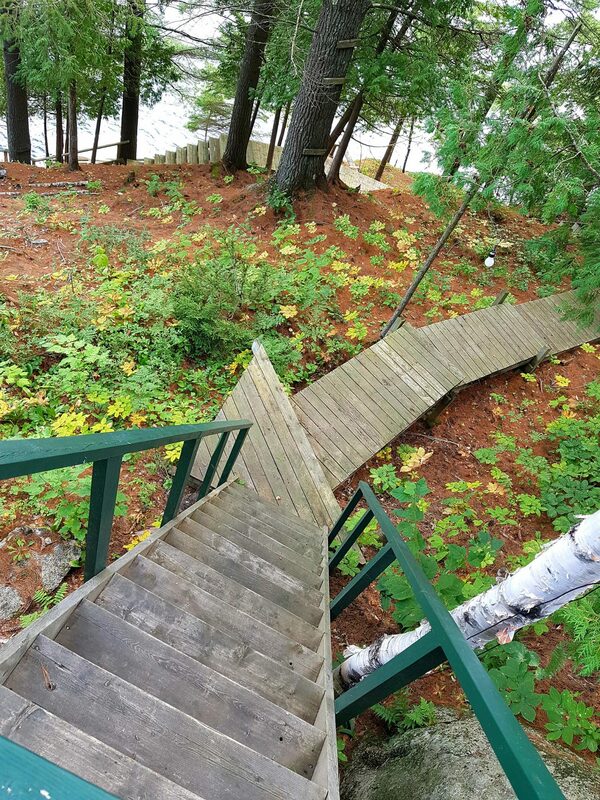 ​Every morning Kina made her way down these millions of stairs to do yoga on the dock. I myself did it a couple of times and I've never felt more alive than after a peaceful meditation followed by a quick dart up the stairs​. ​Okay....so maybe it's not ​millions of stairs, but it is still a very significant amount of stairs​. 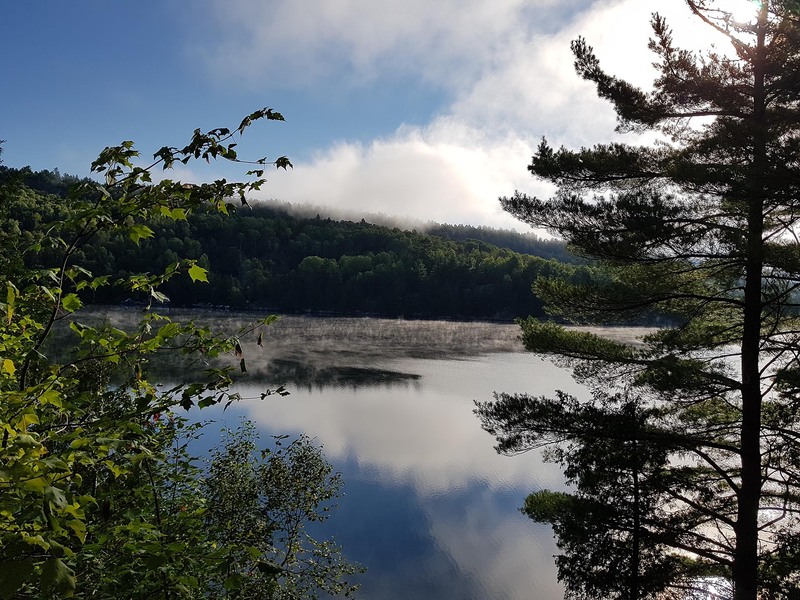 ​See the morning fog dancing on the surface of the glassy lake? ​I also loved learning a bit about Kina's clan through the objects they leave behind. Here were some of my faves. You can tell t​hat creativity runs deep in this gene pool. 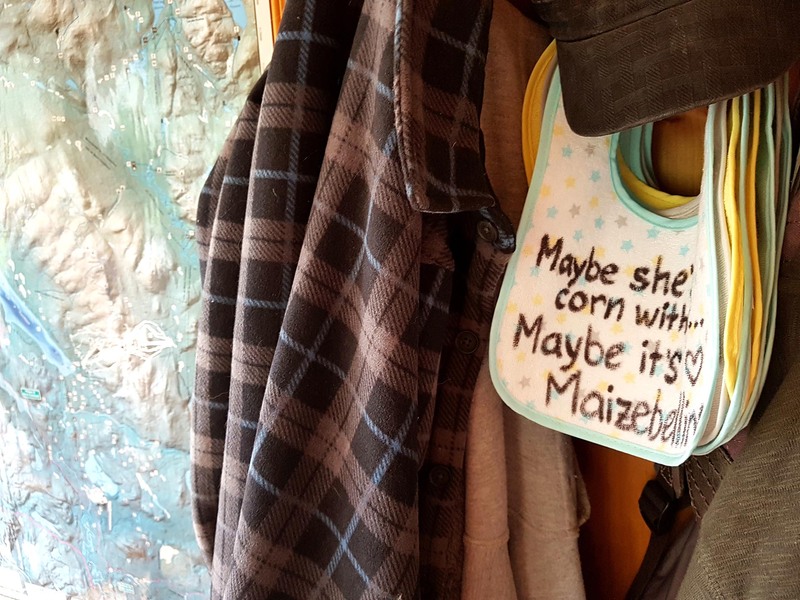 ​Her brother hosted a corn boil with his friends and each of these bibs has a different #cornpun. This was my favourite one. #MAIZEBELLINE people....I died. 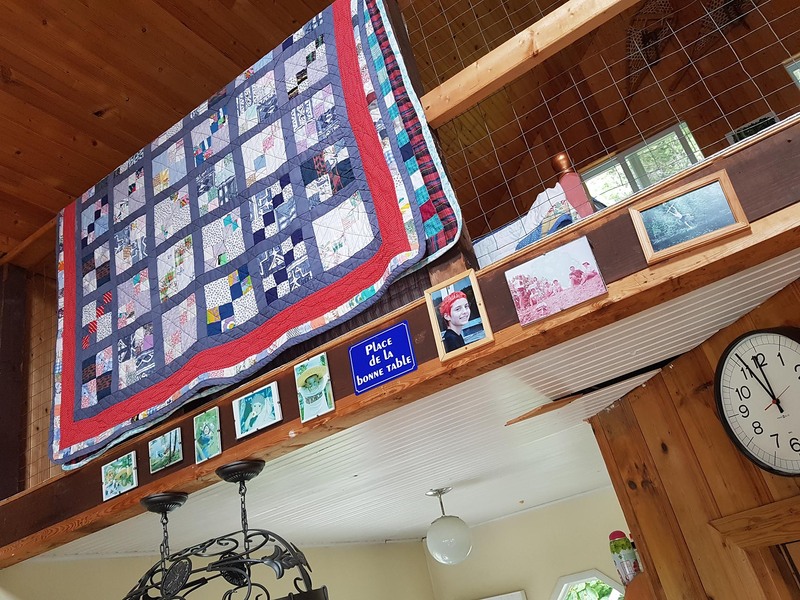 ​One of many handmade quilts ​created​ by Kina's grandmother. Can you spot the teenage Kina? 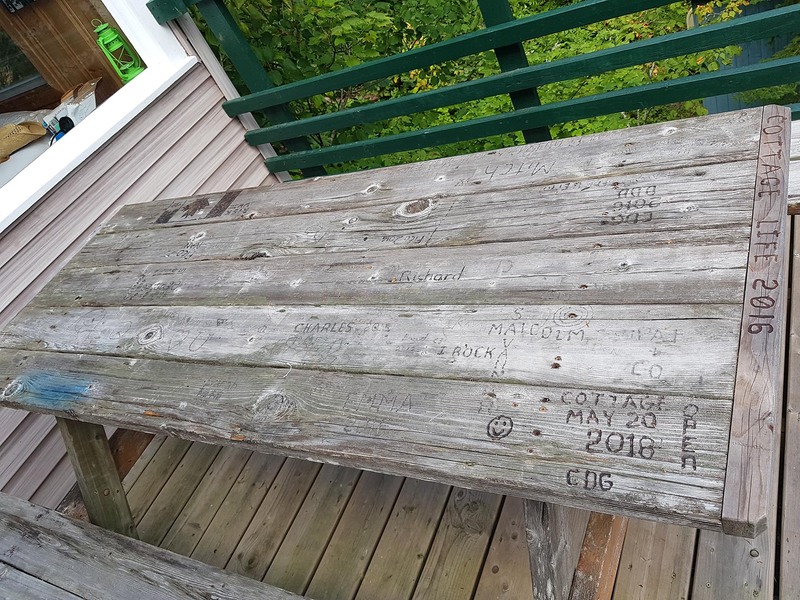 ​Visitors to the cottage burn their names into the table using a magnifying glass! ​Kina's ​dad is a bit of an inventor, ​​throughout ​this cottage you will find clever inventions. 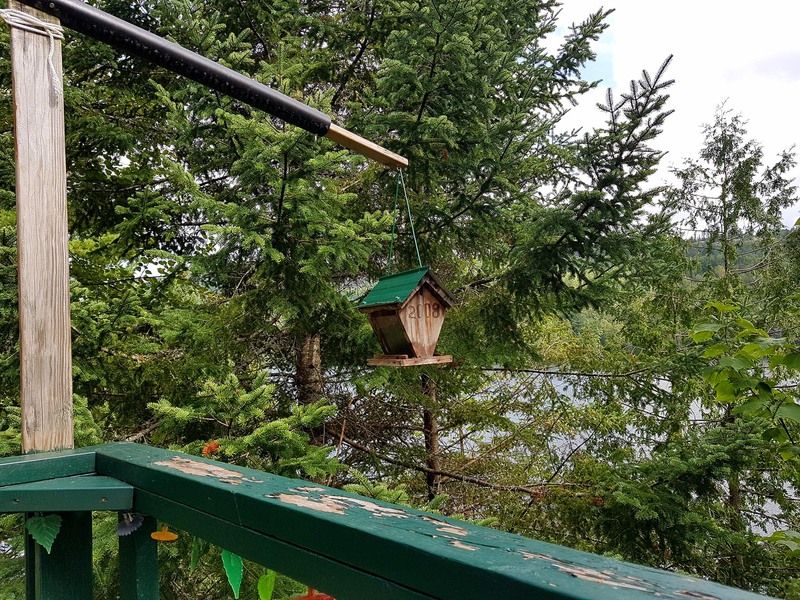 Take these bird feeders for example. 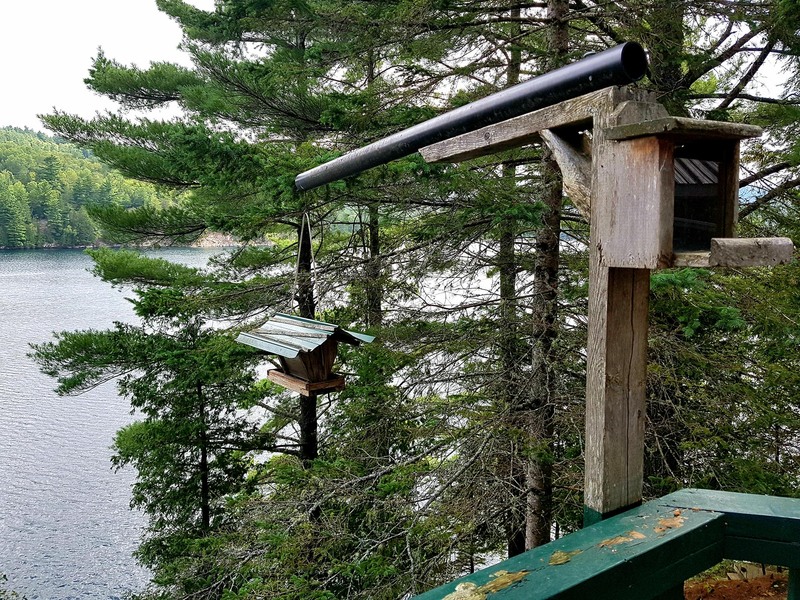 You'll notice that there are two designs for these "squirrel proof-ish" feeders. When we decided to replenish these, we approached them like puzzles that were created for us to solve. We also learned that there is one common design flaw that is shared ​between them: you need long, STRONG arms to put them BACK filled with seed. I learned very quickly that Kina's ​dad is a ​mighty man. ​On the final morning, Kina and I sat outside on the deck and talked about "momming" and all of the different ways we balance our lives around the children, and still remain happy and fulfilled as individuals. Our morning together at that picnic table was the perfect way to "hit the reset" button and get our heads back in the game before the school year began. 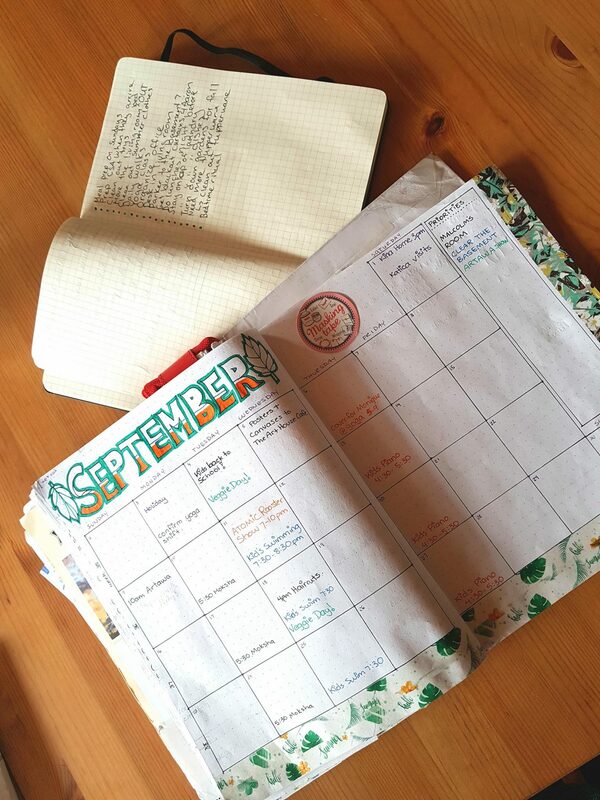 ​Kina makes her own calendar every month using coloured pens and cute tape. I am partial to checklists on grid paper. ​Thanks for the perfect end-of-summer escape, Kina​, and allowing me to take a moment to slow down and breathe before returning to the grind! 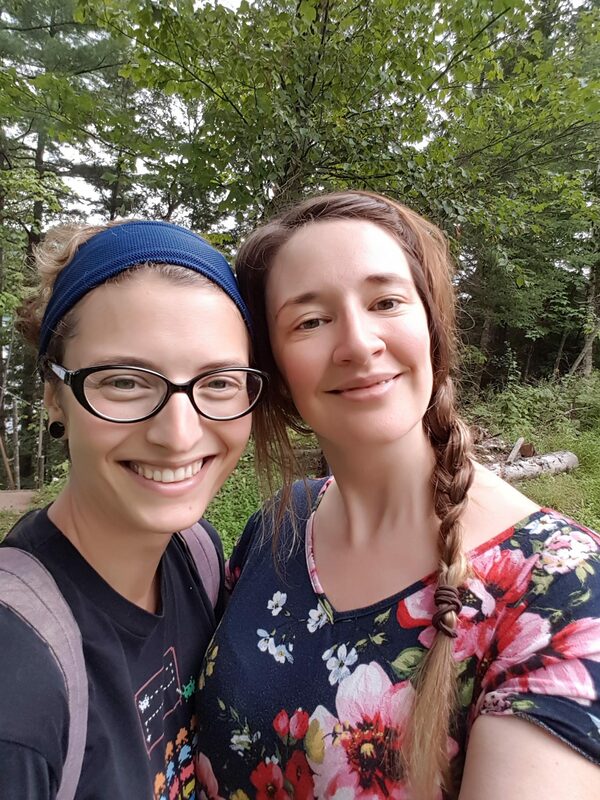 ​Maven Kina and Maven Jen feeling refreshed and ready to take on the world! STAY TUNED! 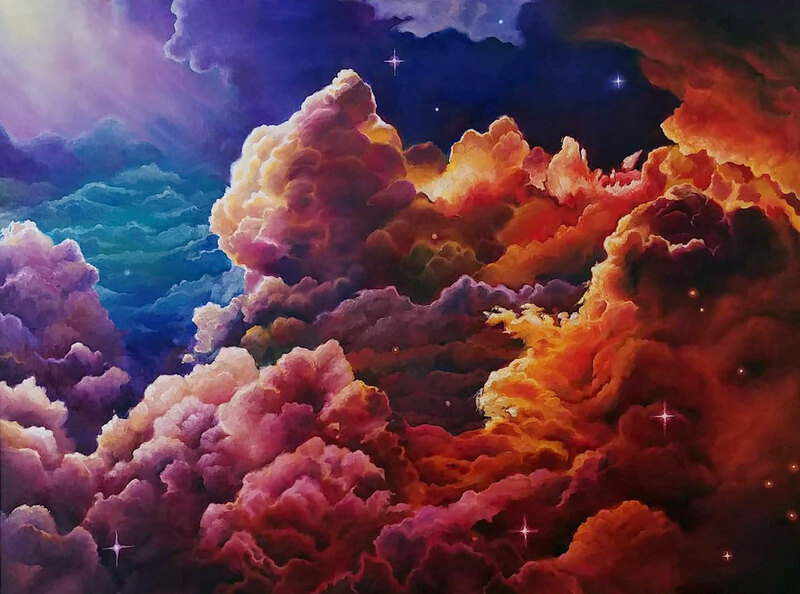 Do you love Kina’s art as much as we do? You should check out her website and order prints for your own collection.